Danielle Oron studied at The French Culinary Institute-now the International Culinary Center-and draws cooking inspiration from her Israeli and Moroccan background. Oron is the chef and owner of Moo Milk Bar in Toronto. 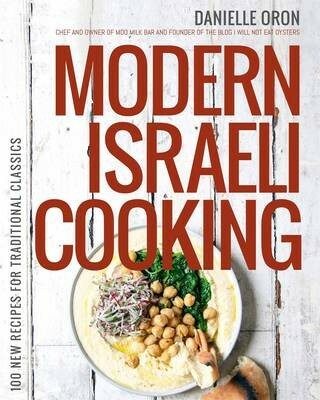 In Modern Israeil Cooking, Danielle offers an incredible collection of Israeli recipes for the modern home cook. She takes inspiration from dishes like Schnitzel platters, potato latkes and falafel and adapts them with a modern eye to create Israeli-inspired recipes like Cornflake-Crusted Schnitzel Sandwiches with Pickled Radishes and Spicy Mayo, Latkes Eggs Benedict with Smoked Salmon and Herby Sour Cream Sauce, and Green Spinach Falafel. Even the format gets a modern twist with chapters like Weekdays-Everyday Kind of Food; Friday-Special dishes made on Shabbat or holidays; Beach-Just like sitting in Tel Aviv on the beach; Midnight-It's late, and you're hungry aka the carb chapter; and more.